This month's Round Table topic, combined with our recent discussion on violence in games, has me thinking about an alternate reality in which Cormac McCarthy's, Blood Meridian, was a video game. McCarthy's novel is one of my favorite pieces of literature. It melds poetry, philosophy, and history to create something that is both beautiful and terrifying. The book explores the nature of humanity, and the role violence plays in defining existence. I imagine it could have first been released as a game, but would people dare play it? The story's grim analysis of human nature would be a shock to players, as it is anathema to how most games handle morality and choice. The default moral position of most games is "good." Whether it is saving the kidnapped princess, defeating the evil space empire, or recovering a long lost artifact, the protagonist of the game, along with their ultimate objective, is most often perceived as based in morality. Samus kill aliens and Mario stomps goombas, but they are excused because their actions are altruistic. In games like Fallout 3, Fable 2, and Bioshock , the player is presented with choices, but these choices tend to stick to a binary construction of morality in which definite "good" and "bad" choices exist. In Blood Meridian, morality is killed. The story is set in the mid-nineteenth century United States and follows a gang of filibusters who indiscriminately kill everything they come in contact with. The closest thing it has to a protagonist is The Kid, a nameless young man whose single-minded focus on surviving in a harsh world sees him act as both a savior and a killer. The closest thing to an antagonist is Judge Holden (referred to throughout the story as "the judge"). The judge is not so much a man as he is an unstoppable force. Eloquent in a multitude of languages, scientifically brilliant, and a master philosopher, he represents the embodiment of human knowledge. He uses this knowledge to spread destruction wherever he goes, and when the filibusters meet him, it seems almost as if he were waiting for them, ready to take them to a place where the only law is strength, and any struggle against this philosophy of kill or be killed is futile. The judge represents history and progress as a sequence of violent acts that create a world order. At first blush, this does not seem to be outside the realm of possibility for video game. Examples of games in which killing is the method of advancing are plentiful. However, at the end of most games, the player is recognised as winning or losing, choosing the "good" path or the "bad" path, saving the world or facing another game over screen. A game faithful to the story of Blood Meridian would contain no such things, and would be challenge the way we think about the "point" of a game. "Moral law is an invention of mankind for the disenfranchisement of the powerful in favor of the weak. Historical law subverts it at every turn. A moral view can never be proven right or wrong by any ultimate test...Decisions of life and death, of what shall be and what shall not, beggar all question of right," (McCarthy, 250). This philosophy is borne out regularly in the book, and I think it is one that could easily be conveyed in a video game. It would take a brave developer to try this, though. The game would have to ditch the notion of "rewards." In a world where violence is a means and an end, there is no reward beyond staying alive. The player could not rely on any help fromNPCs , fellow players, or the environment. Violence would be the primary method of conducting business. Therefore, it would have to be meaningful: Buildings would need to stay destroyed and players would have to forgo magical health packs. Every altercation could result in a possible maiming that would effectively end the player's progress. We think of this as "unfair" or "hard," but in Blood Meridian, this is just life. Perhaps the player would control the kid and journey through this hellish world, focused on defying the judge's commandments. Or, the player could take control of the judge and travel through history, inciting violence and brutality in order to form existence itself. 1. The player, as the kid, would die. 2. The player, as the kid, would embrace the judge's logic, blasting past the platitude of "might makes right" and embracing his true message: Might is existence. The kid would then become the judge, and continue playing the game indefinitely, fated to eternally destroy life in order to define it. 3. The player, as the judge, would grow tired or complacent and succumb to the judge's logic, resulting in death. I wonder what the ESRB would rate this game? Can an "Adults Only" rating be given out based on profoundly disturbing philosophical content? Please visit the Round Table's &amp;amp;amp;amp;amp;amp;amp;amp;amp;amp;amp;amp;lt;a title="Round Table Main Hall" href="http://blog.pjsattic.com/corvus/round-table/"&amp;amp;amp;amp;amp;amp;amp;amp;amp;amp;amp;amp;gt;Main Hall&amp;amp;amp;amp;amp;amp;amp;amp;amp;amp;amp;amp;lt;/a&amp;amp;amp;amp;amp;amp;amp;amp;amp;amp;amp;amp;gt; for links to all entries. "None here can finally comprehend the reason for his presence for he has no way of knowing even in what the event consists. In fact, were he to know he might well absent himself and you can see that that cannot be any of the plan if plan there be." Part of the Judge's nature was that he was chaotic, shooting puppies one second and saving people the next. The idea, how I read it, was that none of this means anything either way. Having the game be one where you just have the player become sick of it and turn the console off would communicate that sense to them. Cool! This would also mean that you cannot release this game on an Xbox because Microsoft requires developers to add Achievements. I agree with your point about pointlessness, and I feel like it would be quite an experience for a video game to convey. It flies in the face of the "progress through the game until you win" mentality of almost all games out there. Maybe Suda51 could pull this off. *Ding* You've unlocked the nihilism achievement! Far Cry 2 seems to have manifested a lot of what you're discussing here. There's still something of a progression (I don't think a mainstream, commercial game could be without at present), but it's still extremely nihilistic with some pretty interesting statements about violence. Have you played it? I'm definitely looking forward to playing Far Cry 2. I hear it's a bit of a time commitment, so I'll need to gear myself up for it. I'm interested in modern Africa as a setting: a lot of potential for powerful statements (and horrible mistakes!). 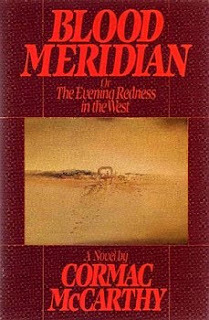 The problem I have with seeing Blood Meridian as a game is one in which society has in part, (rather unfairly I might add) condemned the video game industry for providing, namely, a world in which the sole point of playing is the perpetration of violence. Throughout the book, one is presented with the continued presence of naked, often senseless violence. Having a game in which there is no "message" presents a reflection of society (and rightfully so) so wholly unappealing that the ESRB would never approve of it. I didn't really think too hard about how the gameplay would work, but I have a hunch that the outrage sparked by a Blood Meridian game would be proportional to the realism of the graphics. I wonder if crazy violence and moral ambiguity would rile people up if it was presented in 2D?